What is a Kansas Promissory Note? Kansas Promissory Note: What Is It? A Kansas promissory note is a written agreement between a borrower and lender. The lender provides a loan to the borrower. The borrower promises to adhere to the payment agreement to repay the loan. If a Kansas promissory note provides the lender with the right to collect collateral if the loan goes into default, it is known as a secured agreement. An unsecured agreement still involves a loan and does not give the lender right to collateral if there is a default. Kansas promissory notes must comply with the State’s Contracts and Promises statutes. Interest is also controlled by the State of Iowa. Under Contracts and Promises statutes, the highest interest rate that may be charged is 15% per year unless specifically authorized by law. If a lender charges more than the maximum amount, they may face legal repercussions for breaking the law. The date of creation for the promissory note. This is listed as month, day, and year. It is placed beneath the title. The legal names and mailing addresses of the parties involved in the agreement. The most common parties include the lender, the borrower, and a co-signer. The parties should also have their roles clarified. For example, ABC Financial, Inc., Lender. If the lender’s payment address is different from their mailing address, the payment address should also be listed in the agreement. If the note is secured, it is helpful to list the physical address for the borrower and any listed co-signer. This may help the lender with collecting collateral if the secured note is defaulted on by the borrower. The principal amount of the loan provided. This is the amount of money that the lender provided to the borrower without interest. Interest is addressed on its own. Before executing the promissory note, make sure that this amount is accurate. The amount of interest charged by the lender. Interest is often expressed as either “per annum” or annual percentage rate (APR). This is additional money that must be paid by the borrower for the privilege of being given a loan. In the State of Kansas, most promissory notes may not exceed 15% per year. Payment information. Most Kansas promissory notes are repaid through installments. The note should state how many total installments must be made, when they must be made, and the amount that must be paid for each installment. If the lender uses a late fee, the amount of the fee should be documented as well as when the late fee is added on to the account. Lenders who use a separate payment address should list it here. Secured Kansas promissory notes should also include a description of the collateral that the lender is entitled to receive if the borrower does not pay as agreed. After the agreement is outlined between the parties, it should include some basic clauses. Interest Due in the Event of Default. This clause explains how much interest will be charged if the borrow defaults on the loan. It is particularly important if the promissory note has a lower interest rate if the borrower complies. The higher interest rate (up to 15%) may be reserved for default. Payment Allocation. A payment allocation clause gives a break down of how the received payments will be split between the balance of the loan and the interest charged. Prepayment. When a borrower wants to pay off a loan before the end of the agreement, it is known as prepayment. This clause explains whether the borrower will be financially penalized in some way if they want to pay off the loan early. Acceleration. If the borrower does not comply with the terms of the Kansas promissory note, the lender may demand immediate payment in full. Attorney Fees and Costs. This clause explains how attorney fees and costs incurred by one or both parties will be handled if the court must intervene. Waiver of Presentments. With this clause, the lender is not required to be physically present when the borrower makes payments. Severability. This clause holds that if one part of the agreement is unenforceable, the rest of the agreement will still be in effect. Conflicting Terms. This clause addresses how any conflicting terms in the promissory note will be handled. Generally, it involves the creation of an amendment to clarify the confusion. Notice. This clause explains to the borrower whether or not the lender will notify them if they plan to sue for defaulting on the loan. Governing Law. A governing law clause determines the state whose laws will govern the agreement in the event of a dispute. Some Kansas promissory notes, such as those involved in buying a home, require a notary at the time it is signed by the borrower. 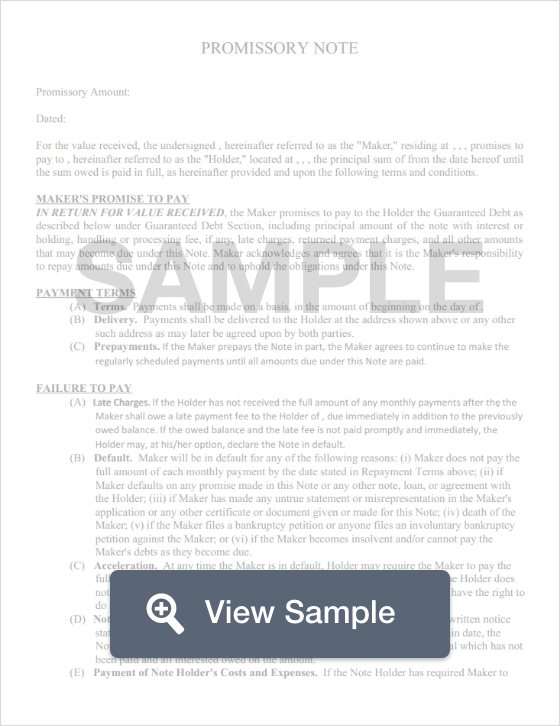 Borrowers and any co-signers involved must sign and date the promissory note.